A huge sunspot, bigger than the Earth is turning to face us. Spaceweather.com are reporting solar activity is low, however, it might not remain so. Big sunspot AR2585 has developed an unstable 'beta-gamma' magnetic field that harbors energy for moderately strong solar flares. NOAA forecasters estimate a 20% chance of M-flares on Sept. 3rd. But you have to go back even further since the last time it released an "X-Type flare," which are very strong and can be considerably dangerous to the Earth and surrounding satellites. Earlier this week a wide gap in the sun's atmosphere opened up causing a monster of a coronal hole, and it is spewing a stream of solar wind into space. Solar wind flowing from the indicated coronal hole is reaching Earth, producing active conditions in the geomagnetic field. Credit: NASA/SDO. NASA's Solar Dynamics Observatory is monitoring the "coronal hole" as it now begins turns away from Earth: Coronal holes are places in the sun's atmosphere where the magnetic field opens up and allows solar wind to escape. 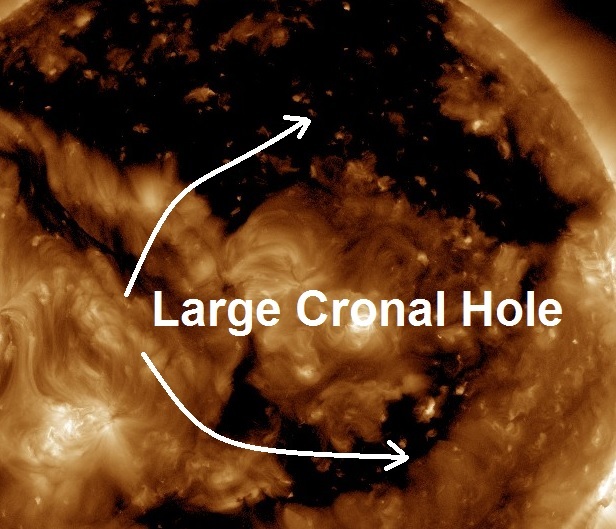 Volcano and quake activity have been high during as coronal hole solar wind pounded the Earth leading many experts to claim the two events are connected.